Financial Institutions: What Drives Value v2 - The Kafafian Group, Inc.
It’s my blog. I can do what I want. 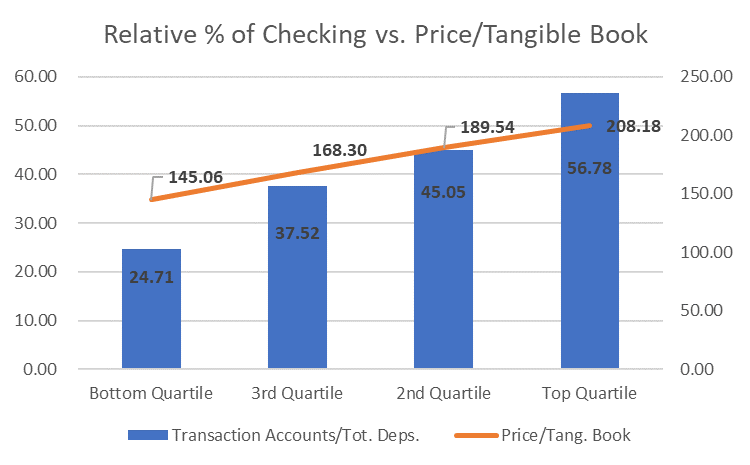 So, is their a correlation between a bank’s relative level of transaction accounts to their price-to-tangible book trading multiple? In reviewing the data that fed the above chart, size was likely not a significant issue. All of the numbers above are medians, not averages. And the median asset size from bottom quartile to top were: $1.6B, $2.2B, $3.2B, $2.1B. Wells Fargo and JPMorgan, the nation’s largest FIs, were both in the 3rd quartile.